Troostwood, located near Troost Avenue is described as having a “small town feel” in an urban setting. Consisting of nearly 400 homes, most neighbors know each other and can be seen “porch hopping,” visiting while on a walk or sharing a backyard barbecue. The neighborhood consists of at least 50% homeowner occupants, a few multi-family dwellings, and some rentals. The median home price for 2015/2016, is $160,000. 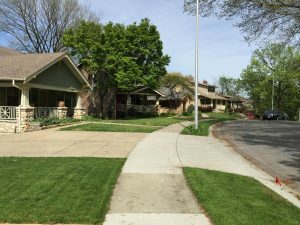 The homes in Troostwood were largely built around the turn of the century, and the development of the neighborhood was closely linked to the creation of what is now Rockhurst University, located on the south side of the neighborhood. There is a strong sense of neighborhood pride evidenced by high volunteerism and participation at such events as the annual neighborhood picnic which includes a cooking contest, a summer garage sale, and neighborhood clean-up days where the association provides dumpsters for yard waste and bulky items. Many Troostwood homes were built around the turn of the century. The diversity of housing stock and residents makes this neighborhood an active and desirable place to call home. Residents are proud to live in a Kansas City neighborhood recognized for its rich diversity. Troostwood residents include families, single adults, young and seasoned professionals, blue-collar workers, college students, entrepreneurs and retirees. The neighborhood is also home to many pets and their proud owners. The racial and economic mixture is vast, making Troostwood a true Kansas City treasure.